When you decide to go with Home Comfort Exteriors, you know you are getting the best quality roofing materials. We use Owens Corning brand Duration TruDefinition 30 year architectural shingles. This line of architectural shingles is the best available with its SureNail technology that is built into each shingle. This fiber mesh strip is what gives these shingles a 130 mph wind resistance rating with only 4 nails per strip! This saves you money on material costs while still delivering better results than the competitors. In addition to the SureNail strip, each shingle has multiple lines of Tru-Bond sealant to further assist in its gripping power. Owens Corning Duration roofing products all come standard with copper-lined granules, which helps prevent algae growth. Have you ever looked around and seen ugly black streaks all over your neighbors roofs? Get your roof replaced with us and that won’t be a problem anymore! These copper infused granules are a revolutionary breakthrough in the roofing industry. 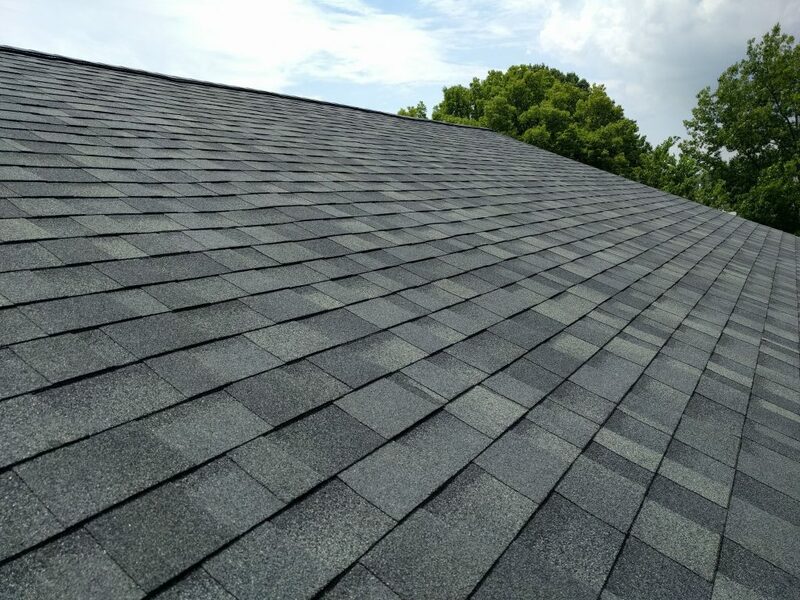 Every roof we install comes standard with Ridgevent, starter, and drip edge – the whole nine yards. Again, we aren’t salesmen who are going to “toss in a free drip edge upgrade”. That’s just a standard practice here at Home Comfort Exteriors. All estimates we send out are line itemized so you can see the exact cost of the products you are recieving. We never cheap out on materials and ensure that our jobs all get done correctly the first time. We are on the preferred contractors list for The City of O’Fallon and The City of St. Peters and have done work through most insurance companies. If your roof has hail damage, we can work with your insurance adjuster and make the process simple and pain free. Click the button below to fill out our simple contact form and we will give you a call to set up a time to come out and assess your roofing needs.